This is the second part to last week’s thrill ride of a REPLY TO ALL: Favorite 16-bit Games of the Cursed. Read on to find out how horrible our tastes actually were as kids growing up. It goes without mentioning that The Legend of Zelda: A Link to the Past is on my list of all time favorites. I can’t believe I forgot to mention it along side Secret of Mana and Final Fantasy VI. There are a couple other games that stand out to me as well, also made by Nintendo. Super Mario World and Super Mario Kart. Dual screens before the DS. How amazing was Super Mario World the first time you turned on the Super Nintendo? It still amazes me to this day. That game is so fun and definitely improved upon on the world map system created in Super Mario Bros. 3. Super Mario Kart brought my sister and I together for some epic clashes that became really competitive. I don’t know why my parents let us keep playing that game, as it always seem to lead to a fight of some sort. It’s still my favorite Mario Kart even though it is a little dated. I was definitely in the fighting game craze with the SNES. Not the best, but memorable indeed. I played a ton of Street Fighter II, Killer Instinct, and Mortal Kombat, being extreemly disappointed that I didn’t have a Genesis since Nintendo edited their version. Putting those aside, I played the hell out of the Donkey Kong Country games. They just looked amazing for that console. Super Mario World was also a pretty flawless game. I never tire of that one. The Super Nintendo era was probably the apex of my video gaming career, and my personal favorite so I may get a bit verbose and repeat what others have said, but that won’t stop me. At that point in my life I was still brainwashed by my subscription to Nintendo Power along with many of my friends so I missed out on many good Genesis games- except Mutant League Football, that was awesome. As mentioned, it was by far the best era for the Square games- between Secret of Mana, Final Fantasy II (IV) and the even better III (VI), but I’m disappointed that Chrono Trigger and the Square / Nintendo partnered Super Mario RPG haven’t gotten their due- easily just below VI if not on the same level in terms of quality. And how about the Super FX chip gimmick? Star Fox was cool (insert your favorite Slippy sound effect here), but I had a whole lot more fun playing Stunt Race FX, and I may have done permanent damage to my right thumb from holding down the B button playing Super Mario Kart. I did also love all the fighting games of that era, but Street Fighter II was the one that really stuck- I can still remember all of the original special moves of all the original 8 characters to this day, and my brother could probably still beat me by button mashing. Infuriating. That is one Super Metroid. 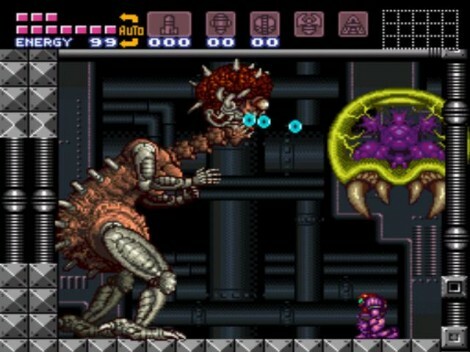 I don’t recall a video game fully drawing me into the experience until Super Metroid– the final boss fight gets a lot of run and it is excellent, but the ambient music and environments were head and shoulders above any other game to that point. I mean, the ghost ship! That’s on top of the aforementioned groundbreaking game mechanics. And speaking of taking a proven formula and expanding on it- A Link to the Past is still the best Zelda game in my book. And of course Super Mario World. I like how they realized they couldn’t really expand past what they did in SMB3, so they added a few mechanics, took a whole lot of other ones out, and focused it into the best pure platforming game maybe ever. Give me a few hours on a random weekend and I’ll show you a 96 with a star next to it. Bravo, Super Nintendo (Chalmers). I think everyone so far has really honed in on the greatest of the great in the 16 bit era and on many of what inspired our generation to get into games so heavily. Super Mario World, Final Fantasy, and of course the onslaught of fighting and sports games. To interject my opinion here, my favorite and most memorable were Super Mario World, Sonic, Chrono Trigger (I never really got into FF much), NBA Jam, Mortal Kombat, and of course Mario Kart. Unfortunately I think I really missed the boat on some of the other games that have been mentioned like Final Fantasy, Street Fighter, Secret of Mana, and Super Metroid. Nobody has mentioned Earthworm Jim! Everyone knows that was the best 16-bit game in which to launch a cow and whip a crow! While I was/am a huge fan of Super Mario World and a lot of the Nintendo games, I never had a Super Nintendo. When it comes to 16-bit I think in terms of Sega, as I was a Genesis dude. I think that means I’m supposed to be a Sonic fan, but I’m just not. What comes to my brain first when I think of the 16-bit era is Earthworm Jim…. and Shaq-Fu. Earthworm Jim is awesome… I was excited when the HD remake came out on XBLA. 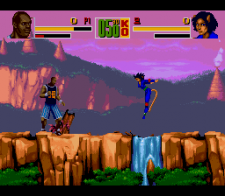 Shaq-Fu is terrible… I’m glad there is no word on any kind of remake whatsoever. I loved me some Earthworm Jim back in the day, but I’m equally surprised that no one has mentioned Boogerman yet. That is one of my all-time favorite guilty pleasures. Interplay definitely knew what they were doing with all their campy games like Boogerman, Earthworm Jim, and Clayfighter. Earthworm Jim, Contra 3: The Alien Wars, Gunstar Heroes, Megaman X, The SNES SimCity, SimAnt, NCAA Basketball (FOUL BY POINT GUARD), Rock N’ Roll Racing, Pilotwings, Super Soccer, Super Tennis, Super Punch Out, Uniracers, and Super Off Road. As for basketball star crossover games, don’t forget the awful Michael Jordan: Chaos in the Windy City, which combined with Shaq Fu and the movie Space Jam helped inspire the modern day Charles Barkley, Shut Up and Jam: Gaiden which I still want to play. … Earthworm Jim, Boogerman, Bill Laimbeer’s Combat Basketball, Primal Rage, TMNT Tournament Fighters, and Shaq-Fu…. Oh man Super Nintendo. That’s my jam! I played the hell out of so many of the games already mentioned: Earthworm Jim, Super Mario World and Super Metroid are easily in my top 10 of all time list. 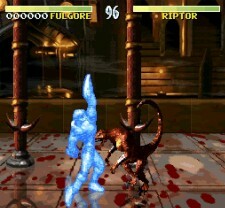 I played those fighters a lot too, Street Fighter II, Clay Fighter, Primal Rage, Killer Instinct. And oh man, Craig, I bet between the two of us, ActRaiser was always rented out. I used to rent that all the time. Maybe not the best game ever made but just a lot of fun. That’s usually the first game I look for when I install an emulater still. Screw Mode 7. Star Fox has SUPER FX!!!!! I have fond memories of Bill Laimbeer’s Combat Basketball also. I haven’t played it in years but I’m pretty sure Star Fox is still the game I can beat the quickest. I was down to like 15 minutes at one point because with the warp thing, you can basically play 3 levels and be done. I’m still better at the original Mario Kart than the N64 version, I played a hell of a lot of that. I also had the Super Mario collection (basically the one they are about to release on Wii). I used to play Mario 3 on it all the time; in college one time my roommate spent pretty much all weekend once beating the Lost Levels. That game was damn hard. Also, I may be one of a small group of people who had the bazooka thing, I think it was called the Super Scope. The game that came with it was pretty entertaining for a little while. I had a couple of the Mortal Kombat games, too; I think I paid 3 the most. I know there were many more I just can’t think of right now. Man, I loved the 16 bit era. We all love videogames and it appears our tastes aren’t that discerning. Well, at least they didn’t used to be. When it came down to what we enjoyed during the 16-bit era, we are all over the map. And that’s okay. We were kids. We played a lot of video games. They all weren’t great. However, they did give us the experience to grow up and create a website dedicated to video games. It was worth it.